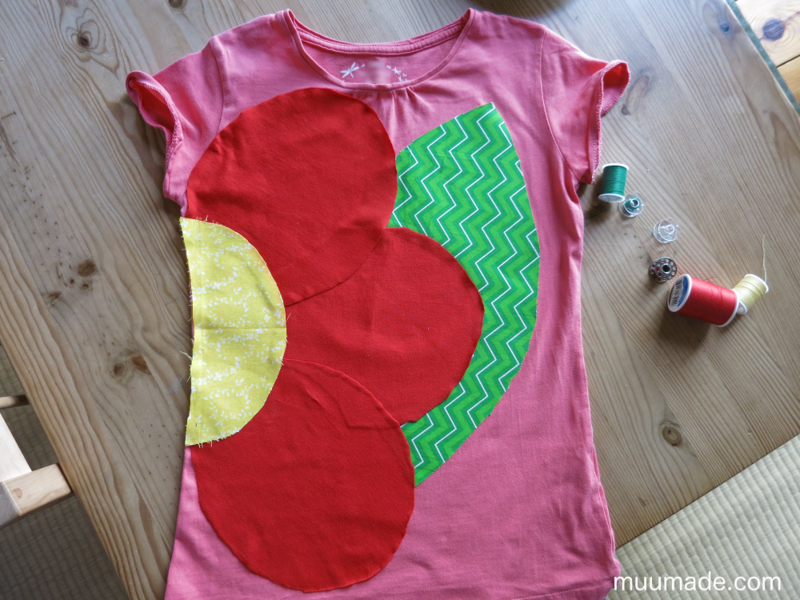 Decorating shirts with your own appliques is a great way to transform boring plain shirts into one-of-a-kind outfits! This is a fun project for children, as well as for adults. Then when finished, you can wear your creations! 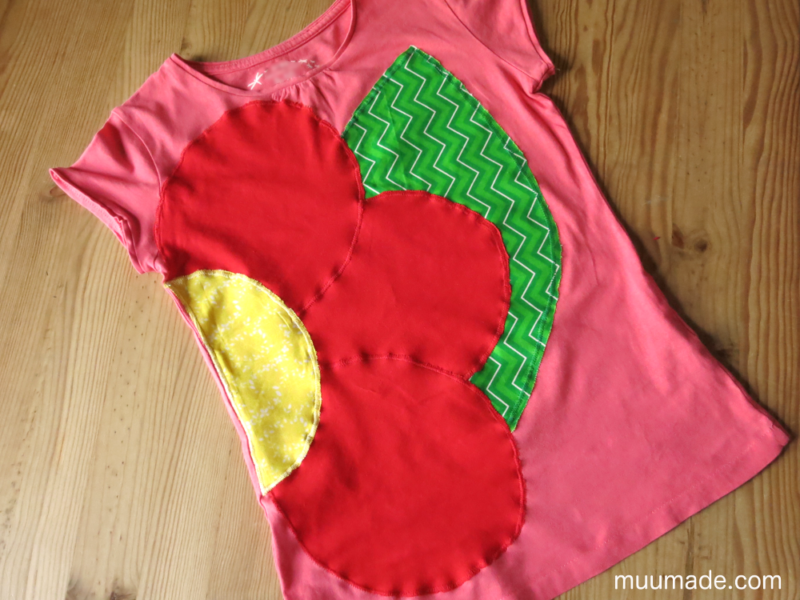 If the children are old enough to use an iron and sew with a sewing machine, they can work on this project from start to finish. The next step is to cut out all of the patterns from fabrics which match your design. I recommend that you avoid thick fabric, such like corduroy and canvas. Essentially, you are adding a layer to the front of the shirt; so you do not want the design to make the shirt too thick and rigid. 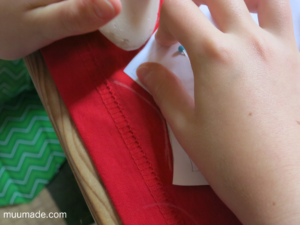 Also, especially if it is your child who will be sewing the applique onto the shirt, remember that stretchy fabric is a bit more challenging to sew than non-stretchy fabric. 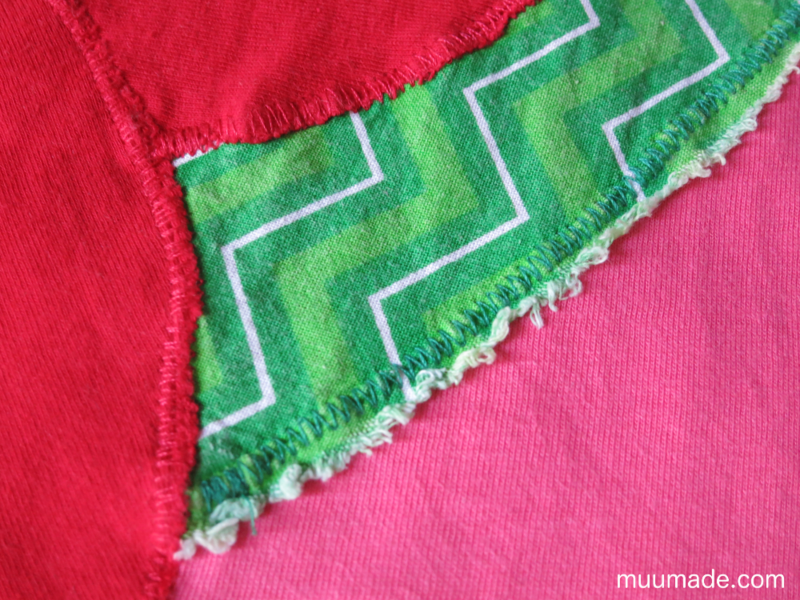 Upcycling old clothes is a great way to find fabric with neat patterns and textures. In the photo above, my daughter is tracing a pattern onto an old red T-shirt to make the flower petals in her design. Another thing to keep in mind when selecting fabric is how much it will fray. As you can see above, the green cotton fabric that my daughter used for the leaf frayed nicely after washing, thus creating a wonderful fuzzy edge for the leaves. In order to create this effect, select fabric that frays easily and, as I will describe later, don’t sew up to the edge of the piece. Cut out the fabric pieces. Next, use your patterns to make the same shapes from a sheet of paper-backed fusible web (we used Wonder-Under). Then trim these pieces so they will be slightly smaller than the fabric. In the photo on the left, the fusible web piece that my daughter made is a bit smaller than it could have been. Wonder-Under requires ironing, so you may have to do this part for your child if she/he is too small to use an iron. First, iron the fusible web sheets onto the fabric pieces by ironing over the paper backing. 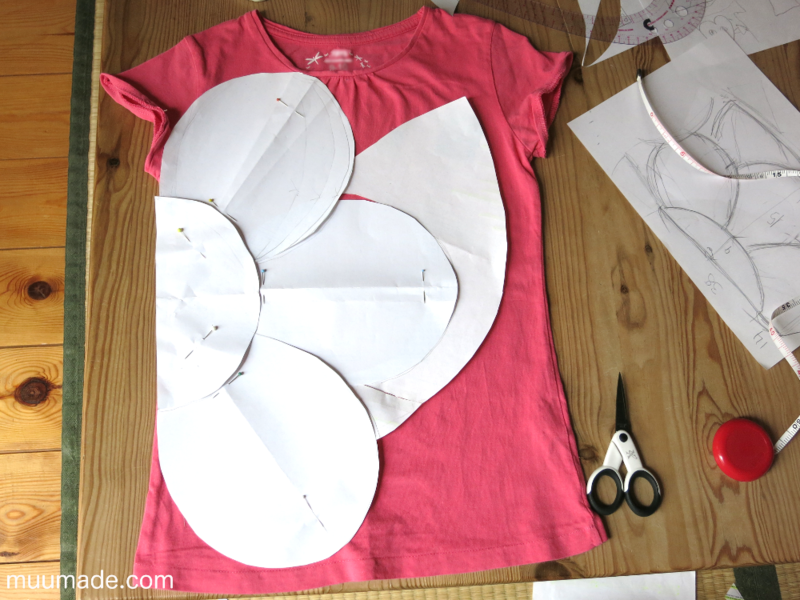 Next, remove the paper backing and then arrange the fabric pieces onto the T-shirt. Lastly, carefully iron the pieces onto the T-shirt, thereby gluing them to the shirt. 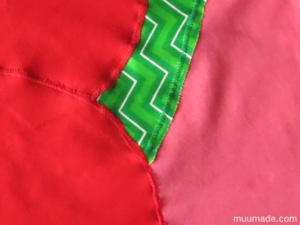 Set your sewing machine to the zigzag setting. I set the stitch width to 5 mm and the stitch length to 0.5 mm (60 spi, stitches per inch). Sew along the very edge of the fabric pieces, unless you want that fuzzy frayed look that I mentioned earlier. If you want to create fuzzy edges, make your zigzag stitches approximately 3 mm (1/8″) away from the edges (note the edge of the green fabric in the photo on the right). 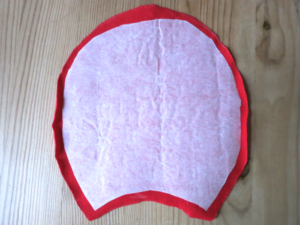 We first sewed the green fabric because it is the bottom layer. Next were the red petals, and then lastly the yellow center. 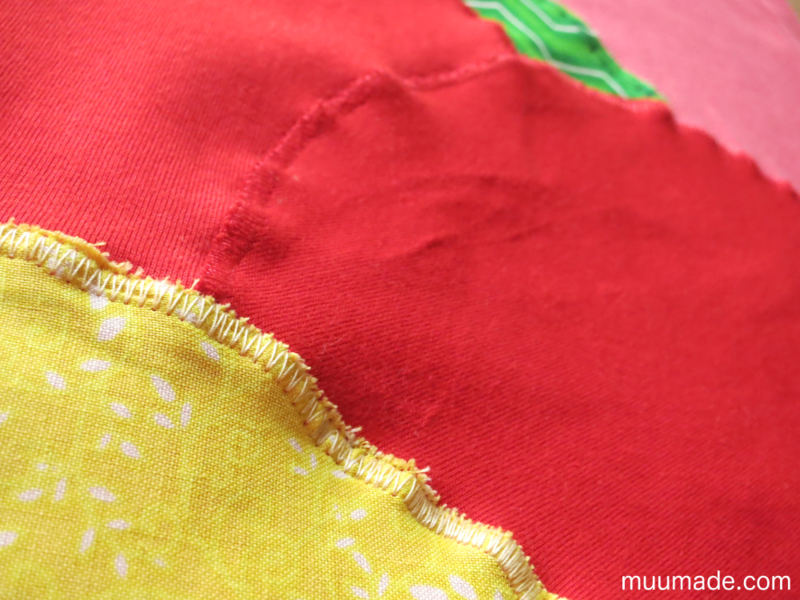 Unless you want the stitches to stand out, I recommend that you use thread that matches the color of each fabric piece. My daughter had a lot of fun making this applique. The best part for her was when she put it on for the first time and showed it to her friends at school. She was very proud of her work! It is time to transform those boring shirts in your child’s (or your own) closet into one-of-a-kind custom designed outfits!